Forest Collective has been creating works focusing on contemporary classical music since it was founded in 2009. In their latest performance, fluttering hearts // thinking machines the company collaborated with queer artist Addison to consider how technology and our emotions intersect and what the impact of modern living has had on our interactions and relationships with others. Joining Addison on stage was an orchestra of ten Forest Collective musicians: Nick Yates, Kim Tan, Vilan Mai, Nathan Juriansz, Clare Gorton, Nikki Edgar, Bec Scully, William Elm, Trea Hindley and Ryan Williams. 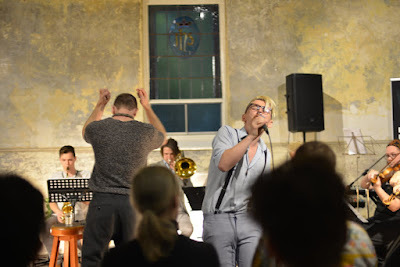 The intimacy of the venue at Abbotsford Convent gave us the opportunity to watch every musician - led by conductor Evan Lawson - playing their instrument and be mesmerised by how each one would lose themselves to the music. The trombonist who closed her eyes and was swept by the music, the flutist who tapped her foot to the beats and the accordionist who used his entire body to play their instrument was enchanting to watch. In turn, it allowed us to give ourselves over to the performance and be taken on our own journey and reflection of love and loss. Addison's original music was perfectly adapted to an orchestral arrangement by Lawson, and Addison's voice added depth and layers to the performance. From the moment he began singing, Addison grabbed our attention and that attention never wavered in this hour long performance. The outpouring of emotion that was evident in not only his voice but in his body and soul reverberated throughout the space, making sure it connected with every single person present. fluttering hearts // thinking machines was a moving and emotional collaboration between Forest Collective and Addison. In the surroundings of the Abbotsford Convent, it was the perfect opportunity to escape from the noise of daily existence and be present in the moment and appreciate the beauty that was being created right before our eyes and ears and to reflect on our own relationships with those around us. fluttering hearts // thinking machines was performed at Abbotsford Convent between 24 - 27 May 2018. The next Forest Collective performance, Berceuse, will be 6 - 7 July 2018. Click here for more details. Addison's debut album is due for release in August 2018.